What if a future Mars mission lands near a crater you’ve named and that name is on every TV broadcast, internet, everywhere during this historic event? Pretty epic, huh? We’re talking about history being made, and that history has already started as the Mars crater naming process is available for public, but now, it’s something special. Uwingu space funding company, among offering nearly 600,000 Martian craters to be named, is now giving everyone a huge one, that would make the headlines someday, like famous Gale crater – Curiosity rover’s landing destination. Big as Florida, the crater is waiting for you till Dec. 15 on eBay. “This is an unique opportunity” said Uwingu’s CEO, planetary scientist Alan Stern. “Our goals at Uwingu are to get more people excited about space exploration, and to fund space exploration, research, and education projects via this new private sector way.” But that’s not all, besides the rights to name this huge crater and helping fund space research, the winner of the bid will also get two VIP passes to the NASA Insight Mars Mission Launch in 2016 and a desk globe of Mars valued at over $300. The crater, 624 km in diameter, located at 25.1 deg south latitude and 327.3 deg east longitude, is larger than 60% of the countries on Earth. What’s even more awesome, if you win the auction, the name given by you to the crater will be on official Mars map of the private Mars One project and will also be carried to Mars by Mars One’s first robotic lander, planned for 2018. But the Dutch ambitious project isn’t about sending just rover, its ultimate goal is to send a manned mission to Mars and establish there a permanent human colony. So the colonists will use your crater names, officially, that’s the result of an agreement between Mars One and Uwingu. 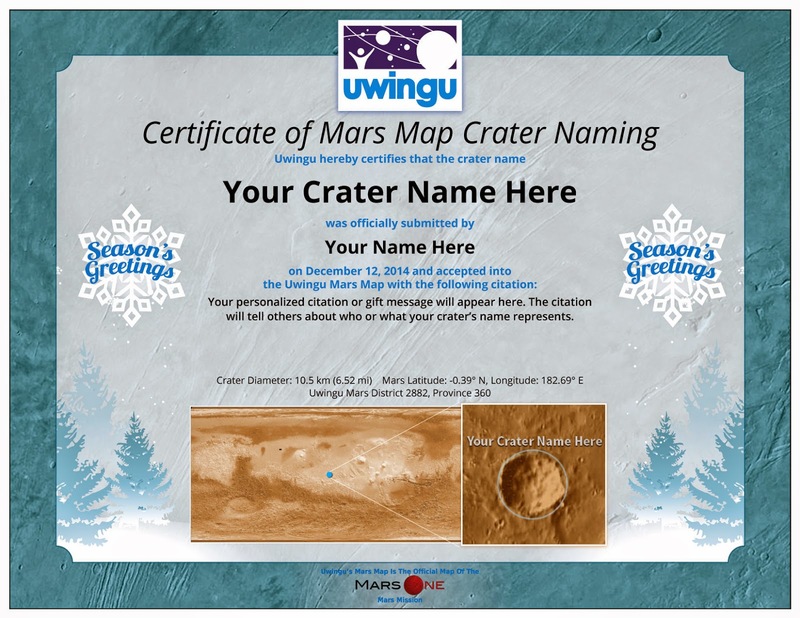 The crater naming certificate would be a great Christmas gift, truly out of this world. It would be also unique birthday or anniversary gift, something very special, not only for astronomy lovers. Naming the largest unnamed crater on Mars is a kind of privilege, a way to give a fantastic experience to yourself or someone special. Uwingu, with over 14,000 craters named so far, more than ten times the number named by scientists in the past 50 years, is in fact creating the most complete map of Martian craters. The prices for naming rights range from $5 to $5,000 depending on crater size. It’s important to note that Uwingu’s initiatives are fueling space research and education. The list of the recipients is still growing bigger. The auction on eBay is also a reminder of the 50th anniversary of NASA’s Mariner 4, the first mission to Mars, launched on Nov. 28, 1964. To celebrate the anniversary Uwingu has also successfully sent almost 90,000 messages to the Red Planet, during the ‘Beam me to Mars’ event. Bidding started on Dec. 5 and will conclude on Monday Dec. 15 at 4:59 p.m. Mountain time. There are currently 12 bidders and 42 bids have been already placed. The one and only Florida-sized crater won’t wait for long, so place a bid now, win and create Mars exploration history!